We're always learning about different resources available to pet collectors and battlers, from new addons to new websites. Here are three that could be just what you've been looking for! Tired of searching through each of your character's reputation tabs to see which one has enough favor to purchase a reputation vendor pet? 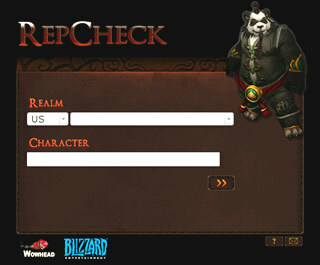 RepCheck simplifies the task, and makes it easy to see which pets are available for each toon. After entering your region, realm, and character name, RepCheck will present you with a filterable list of all your reputations. Each one is listed under its corresponding expansion, which makes sorting even easier. You can filter for a number of items, but best of all... pets! Give RepCheck a try, and you may find that you're eligible for a reputation pet you didn't even know about! Wowhead has put together a comprehensive guide on the Tamer quests, dailies, and rewards. It showcases the quest chain necessary to unlock each continent's Tamer dailies, as well as the location for each Tamer. With all of this knowledge under your belt, you'll be able to go out there and tame the world with ease! Players from all over the U.S.A. and in many other nations can bring their roster of pets to participate in our tournaments. Up to 64 players will compete each season for bragging rights and the title of GPBL Champion! Visit the Global Pet Battle League website for all necessary info. Be sure to read the RULES page in detail and make sure you can be available for the Qualification and Tournament dates listed on the main page. Once you understand the rules, click the "Register" link (top navigation) to enter your info and sign up. Once we've received your registration, you'll be notified of the start time for qualification play (if necessary) and your seeding in the tournament bracket itself. Official start times will be announced and sent to all registered participants. From there, all you need to do is show up with your roster of level 25 pets and get ready to battle! Put your skills to the test in this competitive Pet Battle environment. Register now and get your chance to show all of Azeroth that you ARE the very best!